The dig has ended, the cabins are gone, and backfilling will start soon. It has been a truly epic excavation this season, with unprecedented finds and a whole host of new friends made! A wonderful view of the excavation after digging ended, looking back towards the village. Photo by AD Photographics. The sheer amount of archaeology in the two trenches we opened, and the fact that we accomplished so much this year, is testament to our extremely hardworking volunteers and students. Thank you all for volunteering your time and efforts this summer! In the final week we marched on with excavation so that we could leave the dig with as much completed as possible. Post holes in the post-built structures in trench 1 (you can spot these phased buildings in the photo above) were targeted and volunteers and student steamed ahead getting these done in the last days. Getting all the paperwork finished up was a huge priority for staff in the last weeks and even days – once you are back in the ‘real world’ you can’t measure, photograph, describe and check the composition of a feature when you’re in the office, and any problems with cross-referencing have to be sorted out in the field. All this paperwork and recording doesn’t mean we didn’t make any new discoveries, though! The main area that continued ‘going down’ was the large midden pit. In previous blog posts I have described layers of burning, broken up hearth material, kiln or furnace lining, and huge dumps of iron smelting slag, testifying to significant metalworking taking place at Lyminge. Finds from these layers have shown 6th century dates, proving that we have some of the earliest iron working evidence in Anglo-Saxon England. These large and heavy chunks of iron slag will not have been moved far – iron working is absolutely taking place on Tayne Field in this early period, and the in situ hearth discovered a couple of weeks ago around 60cm into the midden deposits proves this. 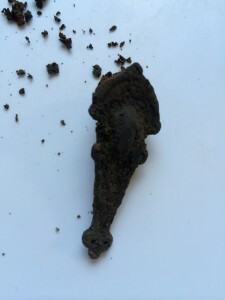 In fact, the sheer quantity of metalworking evidence recovered from this area leaves the significance of Lyminge as a metalworking site unquestioned. Not only is ironworking happening at an early period at Lyminge, but the quantity of scrap metal in the form of copper alloy sheeting, fragments, blobs of bronze and indeed mould and crucible fragments is indicative of fine metalworking. 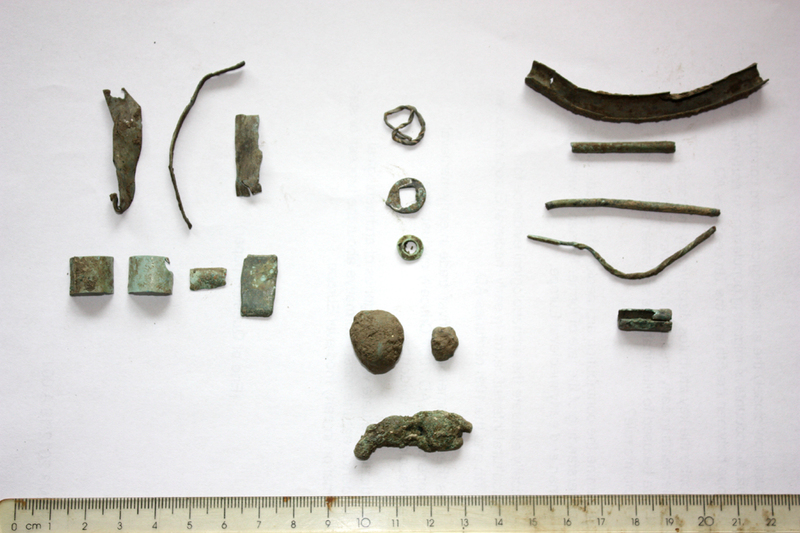 Just a sample of the copper alloy recovered from those areas of the midden that were excavated (not even a quarter of the full size of the midden pit) is pictured below. 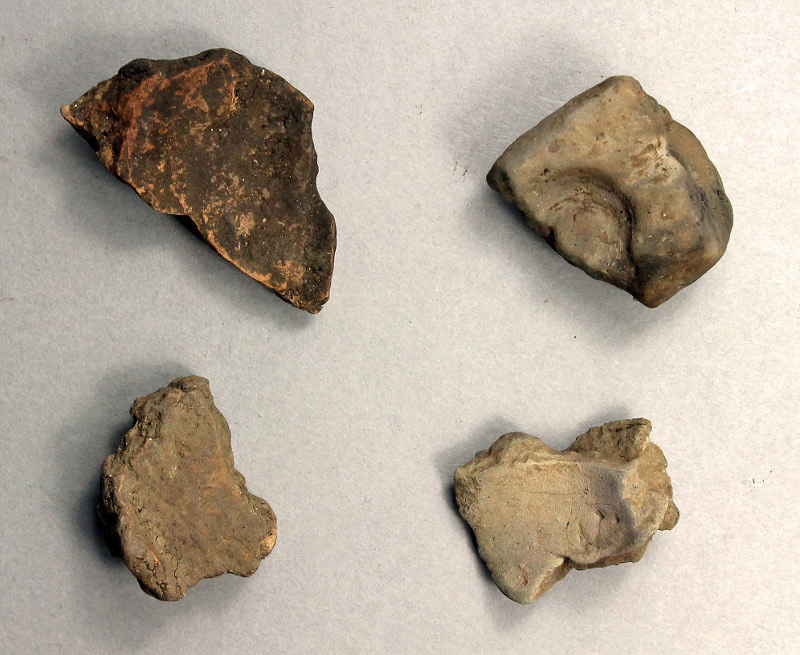 A selection of fragments from the midden attesting to 6th-century bronze working (both sheet metal and casting). In addition to fabricated strips, collars, tubes and wire fragments, the selection includes globules of raw metal and melt. We hoped that as we dug through the midden layers, we would begin to find clear evidence for the reason the pit was dug to begin with – perhaps in situ furnaces or iron/metalworking debris. Interestingly, what was discovered was a dump of quite clean clay material, with very few finds at all, overlying a most unusual laid surface of huge unworked flint nodules. The laid flint nodules in the bottom of the slot dug across the huge midden pit in the south-east corner of Trench 1. The wonderful colours of burnt daub, furnace lining and carbon are visible in the section. Some of the flint surface removed to reveal more clay below. It is clear, particularly from the photo above with a few of the flints removed, that there is another layer of clay below the flints. At this stage it is not entirely clear what the flints were laid for – it doesn’t appear to be a metalled surface such as the one that is present on the north edge of the midden, as the flints are very large and do not appear trampled or laid particularly flat. Perhaps an organic surface was laid over the flints? Or perhaps some kind of superstructure needed the stability of the flints beneath it? There is no obvious burning associated with the flints, and at the moment we are considering several options. 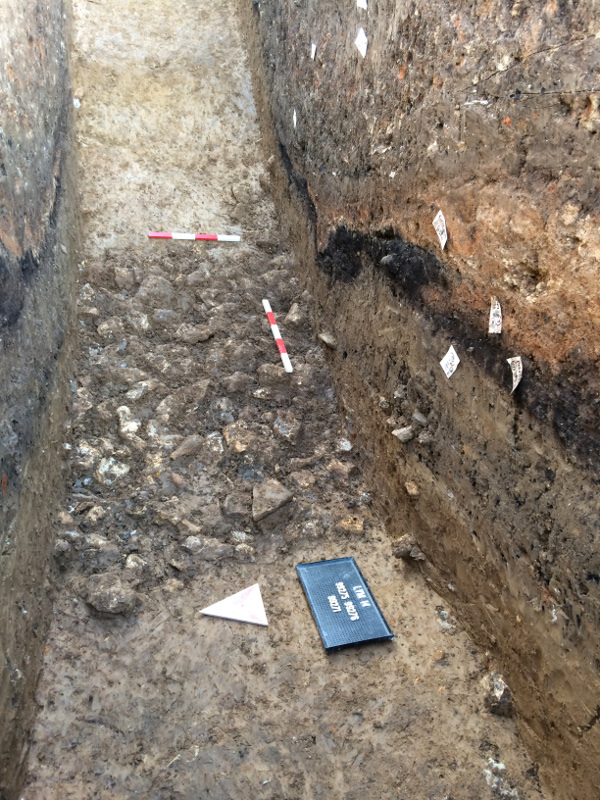 The flint surface is also evident in the north-south transect dug through the midden, so it is not just confined to the area photographed above. At this stage the depth was around 2m, and it was clear that we had not reached the bottom of the pit. 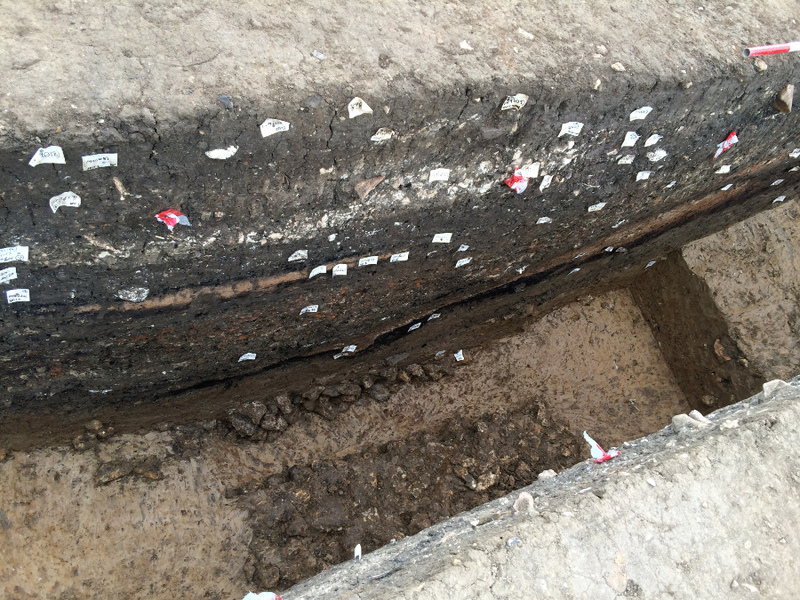 We had hoped that going deeper would resolve our questions about what the pit was dug for! 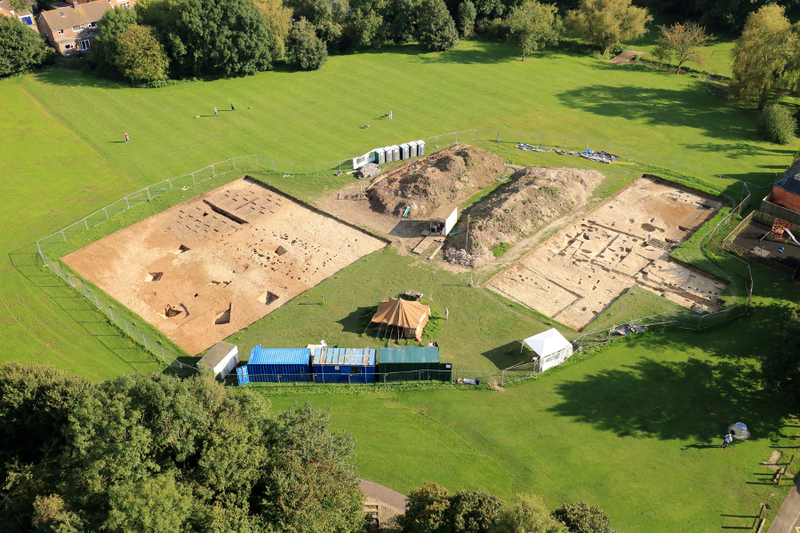 We even considered the possibility that the pit might have been dug in prehistory and reused by the Saxons. What we do know is that it seems likely that the flints were placed in the Saxon period, because a deposit of early Saxon pottery immediately overlay the flints, and one would expect much more silting between the flints and the pottery layer if several hundred years had passed between their deposition. We were lucky enough to recover some significantly sized animal bone which has been sent for Radiocarbon dating to, we hope, confirm our suspicions. 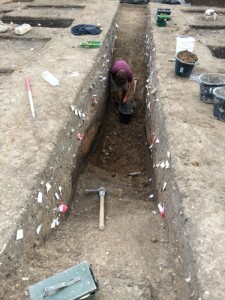 All in all, the midden pit has been one of the most intriguing and productive areas of site this year, and an early Saxon feature that is unprecedented on Saxon settlement sites. Already plans are being hatched to see if we can return for a test dig to answer some of the hundreds of new questions we now have. As well as further discoveries, the final week held some other moments of fun too! 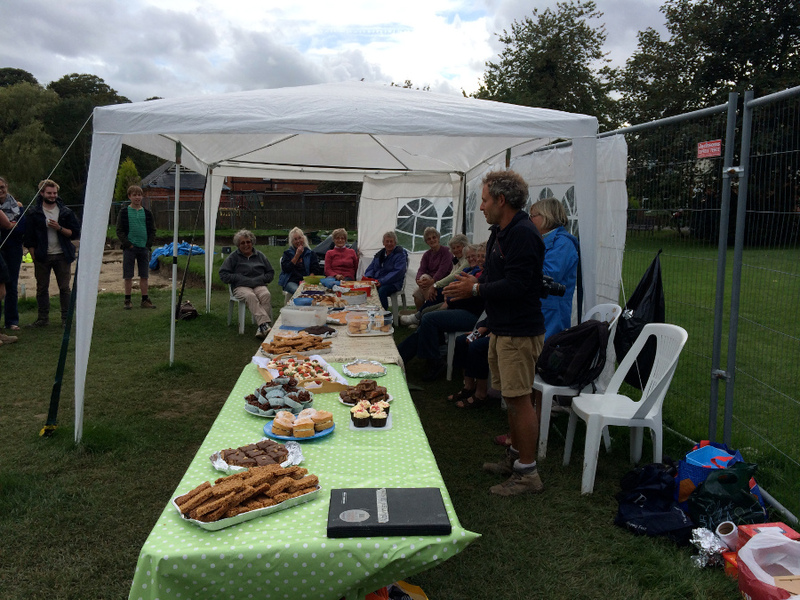 As is now a Lyminge excavations tradition, several of our volunteers, particularly those who help with finds washing, produced a fantastic afternoon tea for all the volunteers and staff. After Gabor thanked everyone and said particular thanks to individual volunteers who had been incredibly generous with their time and energy on the project, we all tucked in to some wonderful sweet and savory treats! The last Friday of the dig, however, would not be complete without Gabor’s annual end-of-dig lecture to the Lyminge Historical Society in the Methodist Church opposite the dig. 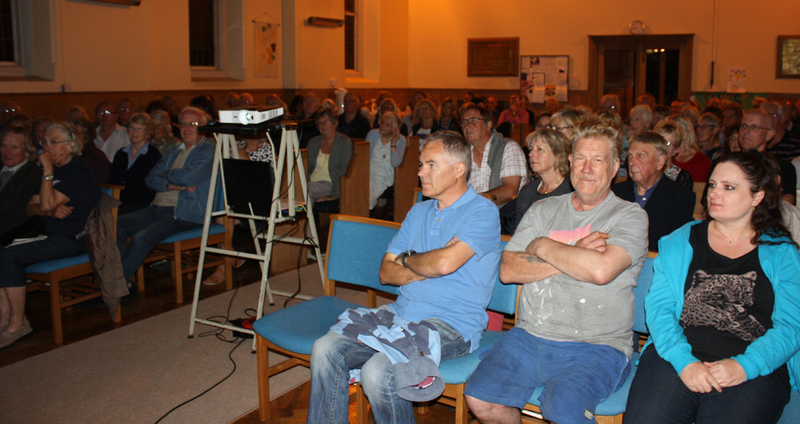 It was amazingly well attended, as has become usual! 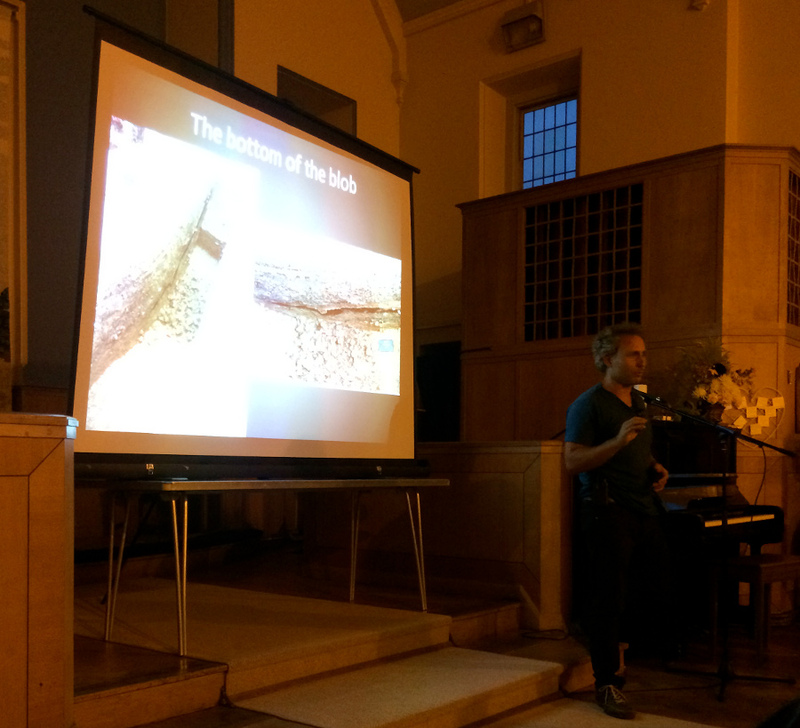 Gabor explained what we had hoped to find when we started the dig season back on July 21st, and showed some of the wonderful discoveries we have made this season, many of which you’ll see if you go back through the blog over the past few weeks. 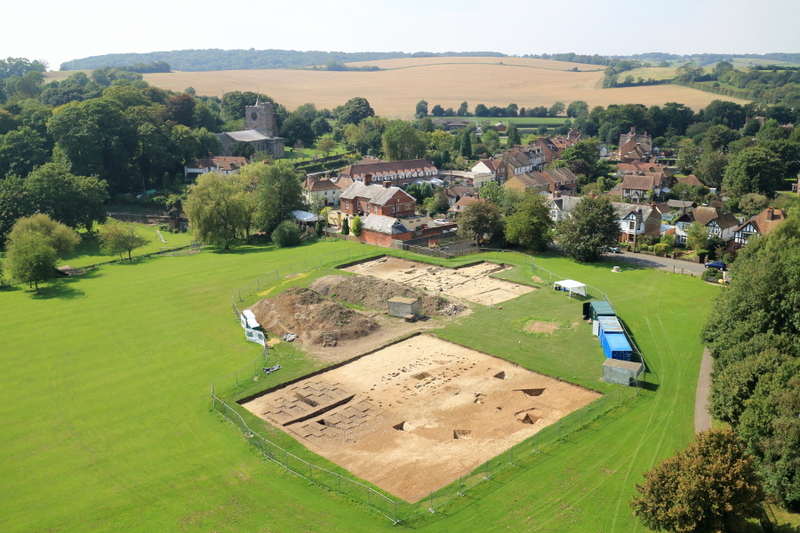 Of course, if you are local to Lyminge and walk past the dig on your way through the village, you’ll have seen that although the dig officially came to an end on the 31st August, there were still a few people on site for a further week after that – albeit a bit of a quiet sort of week! Those who attended the lecture in the Methodist Church got a very up-to-date overview of the dig, but a few small things continued (mostly drawing and paperwork, as usual!) after the volunteers and students left. One of the most exciting events was the taking of the aerial photos, which never fail to excite the team. 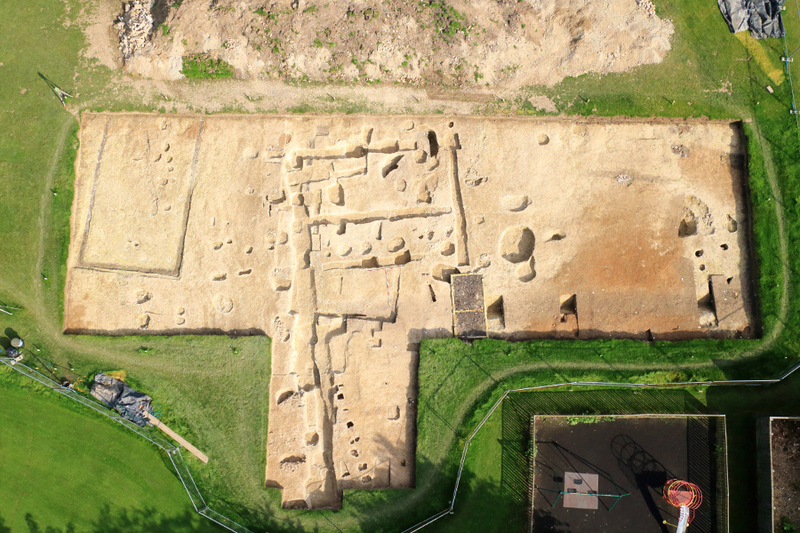 All our hard work through the 6-7 weeks of the dig is shown up beautifully with the use of helicopter drones (this year manned by Alan from AD Photographics), which really helps us understand the layout and relationships between features that just can’t be seen from the ground. 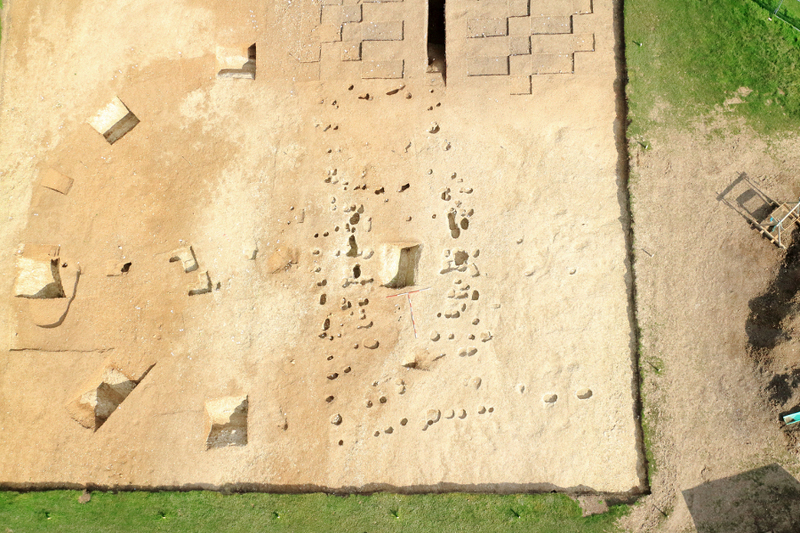 In the aerial photo above you can see the slots that were put across the Bronze Age barrow ditch, as well as the overlapping footprints of several 6th century post-built halls in the bottom right (south-west) corner of the trench. In the top right (south-east) corner, you can see the methodical way in which we excavated the midden area, moving to longer transects as we became aware of the depth of the feature. 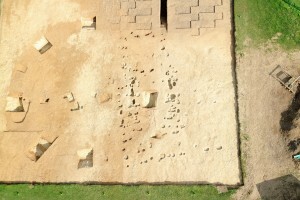 From the above image you can also see a ‘halo’ of orange clay surrounding the midden. This is in fact the full extent of the midden pit, (which we were unable to bottom in the time we had) and which overlaps the barrow on the western side of the midden. This overlap was proven in the most easterly slot through the barrow, showing that the pit cut the barrow ditch and therefore is definitely later than the barrow. The trench 2 photos are no less fascinating! It’s been very difficult trying to show you the ephemeral wall trenches of potentially one of the largest 7th century timber halls found in the south of Anglo-Saxon England from the ground, as the archaeology is very complicated with the three phases of reconstruction in different forms. of the long walls of the hall are visible here too, as well as further postholes within the footprint that relate to different phases. 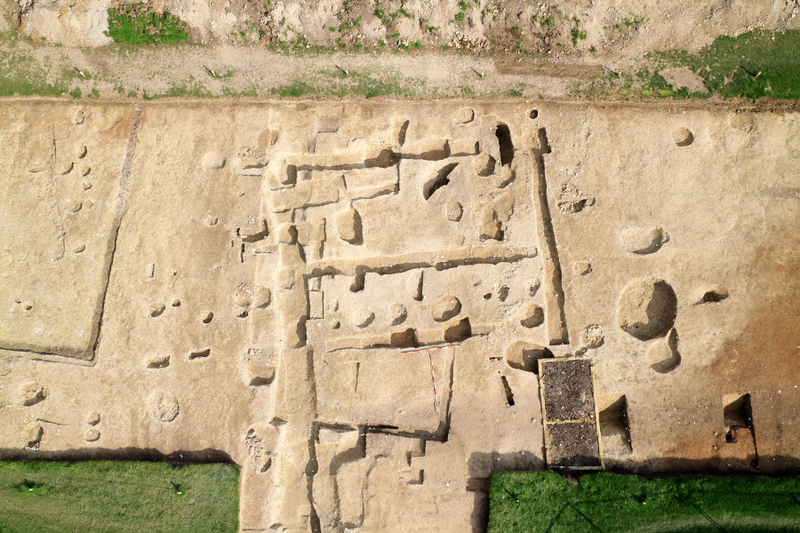 This hall is a substantial size and we clearly haven’t been able to excavate it all – it is likely that it could be up to 30m long. 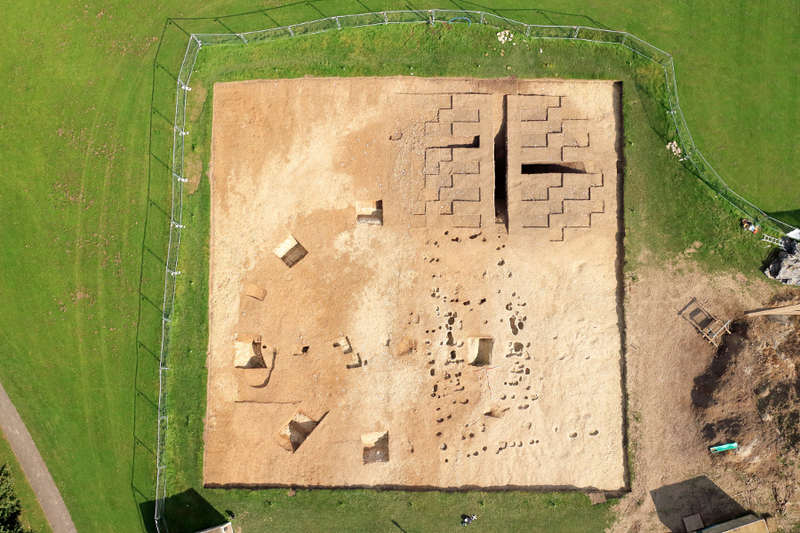 The sheer amount of archaeology that was achieved this summer is clear from these fantastic aerial photographs. It could not have been done without such a dedicated team of volunteers, staff and students, and Gabor and I thank everyone who took part, in however small a way, for their contribution to a season that will put Lyminge on the map as a nationally significant and unique Anglo-Saxon site, if indeed it wasn’t on there from our previous seasons! 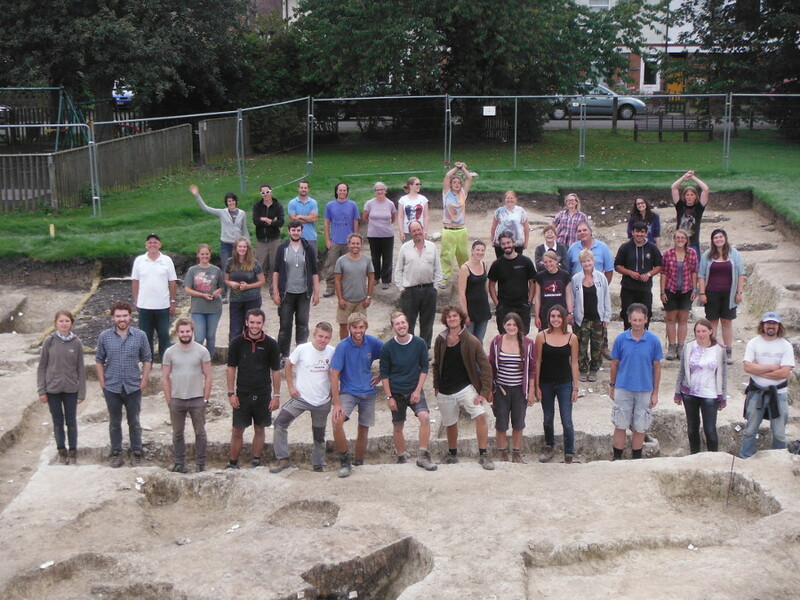 As many of the team as we could gather on the last official day of the dig. The project continues until June 2015, with as much post-excavation, outreach and desk-based research as we can manage! I will of course keep you updated with all the exciting finds we make during the year, as there are sure to be several, particularly with the radiocarbon date for the midden that we are expecting soon. 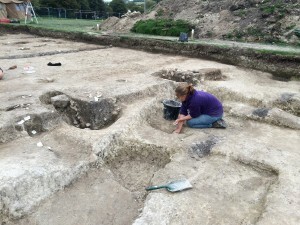 Don’t forget keep your eyes peeled in November as the dig will be featured in ‘Digging for Britain’ on BBC4. I’ll bring you dates and times when I have them. For the moment, though, we’re all still recovering from an intensely busy, exhausting but spectacular season on Tayne Field. Thank you for sharing in it with us! It has been a pleasure & privilege to be involved in this fantastic and exciting excavation.In anticipation of your return you know where I am! !